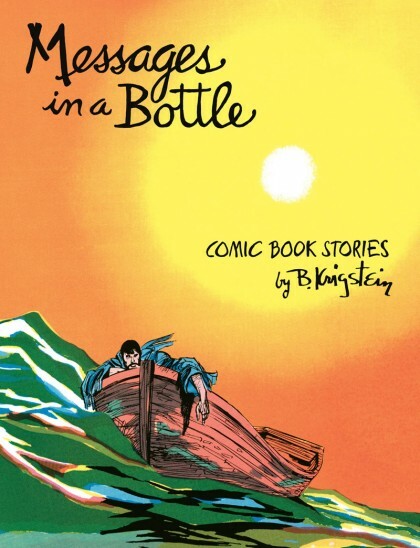 CRAIG’S PICK :: MESSAGES IN A BOTTLE: COMIC BOOKS STORIES BY B. KRIGSTEIN: A confession: until 2002, Bernard Krigstein was one of my least favorite of the E.C. artists. I preferred Graham Ingles’ drippy corpses, Johnny Craig’s noir angularity and Jack Davis’ rubbery bigfootery over Krigstein’s minutely divided, precisely timed panel layouts. I had read essays by critics convinced of Krigstein’s genius—most notably in Squa Tront #4 (1975), featuring a classic page-by-page analysis of “Master Race” by John Benson, David Kasakove and some obscure fanboy named Art Spiegelman—but I didn’t really “get” Krigstein until I read Greg Sadowski’s spectacular B. Krigstein: Volume One (1919-1955) (Fantagraphics 2002). Sadowski’s book is one of the best biographies of a cartoonist I’ve ever read, full of rare visuals (Krigstein was an impressive Expressionist painter), tart testimony (check out page 145, where Robert Kanigher calls Krigstein “a liar”), reprints of great stories (“Master Race,” E.C. adaptation of Ray Bradbury’s “The Flying Machine”) and sharp visual commentary. Thanks to Sadowski, I’m now crazy for Krigstein, and I’m eager to read the second part of Sadowski’s biography, which promises to cover the second half of Krigstein’s career, from 1955 to his death in 1990. In 2004, Fantagraphics published B. Krigstein Comics, a collection of stories designed as a supplement to Sadowski’s biography. The quality of the scripts varies widely—E.C. tales like “Pipe-Dream” are the pick of the litter—but B. Krigstein Comics ably represented the oeuvre of one of comics’ early visionaries. reprints the out-of-print 2004 hardcover B. Krigstein Comics, with a number of stories re-tooled and improved in terms of reproduction, and several new stories added. Legendary EC colorist Marie Severin, in her last major assignment before her retirement, recolored 20 stories for this edition. The remainder has been taken from printed comics, digitally restored with subtlety and restraint. Original art pages, photostats from Krigstein’s personal archives, and an extensive set of historical and editorial notes by Sadowski round out this compelling volume. Sounds lovely, especially for readers who don’t already have B. Krigstein Comics. Messages is also formatted in virtually the same dimensions as the volumes in Fantagraphics’ E.C. Comics Library set, and should fit neatly on the shelf with Corpse on the Imjin! and Came the Dawn. Find yourself a copy of Sadowski’s biography, read it alongside Messages in a Bottle, and feel comics history come alive. And below is a portrait of Bernard Krigstein drawn by master caricaturist Drew Friedman, and purloined off Tumblr. Just because. Excellent preview Craig. Sadowski’s biography and B. Krigstein Comics are on my shortest list of books that require saving in case of a fire. For me, the Krigstein comics are not only mandatory material for the budding artist, but also, for any future comic writers –this is a textbook of page layout and story pacing. The artist can make any story interesting. 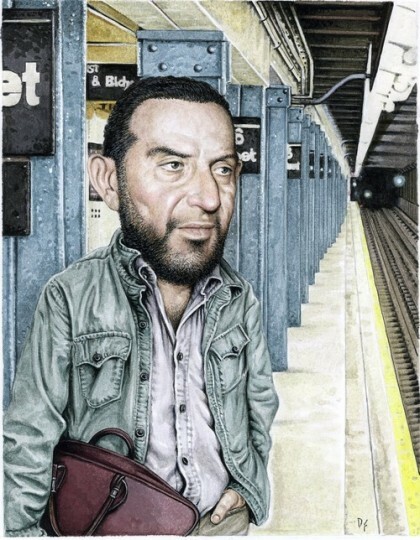 Lastly, Friedman’s portrait– of course the artist is on a subway platform. where else should he be?